The BOSSCOM HDMI Crimping Kit is a complete solution to individual HDMI cable lengths on site. The set allows, while laying the cable to make custom HDMI cable lengths without losing performance quickly and easily. Ideal for professional audio / video installations and media technology, digital signage, or home theaters and other applications that require specific cable lengths. The BOSSCOM HDMI Crimping Kit includes everything, that is needed to assemble and test a HDMI cable. 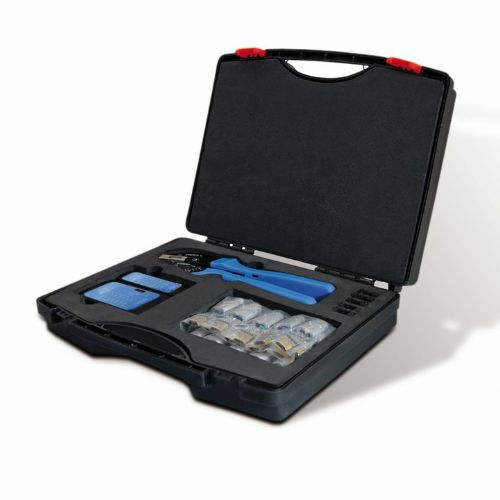 It is an ideal tool for any technician and installer and should not be missing in any installation. With the kit, both customized cable lengths can be assembled and faulty or damaged HDMI Plugs be repaired.